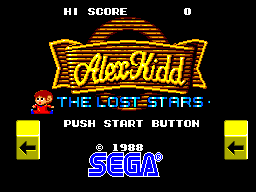 Let's start my 2nd Master System review with a conversion of the arcade game as well as the first sequel to Miracle World simply called Alex Kidd the Lost Stars. Talk about changing the formula way too soon but since this was originally an arcade game I'm not gonna go too hard on it. Even with that said it would be a bit of a stretch to say this is a good game. It's not a bad game by any means and I'll explain why. You obviously play as Alex as he collects six zodiac symbols I guess and goes into outer space to stop the evil king. All you do is jump, run, avoid enemies and hazards. You can get a power-up to shoot at enemies but that's it. There's 14 levels in the ga.. oh I'm sorry I meant 7 levels times 2, so this game has Ghosts n Goblins syndrome but at least that game is more enjoyable (except for the NES version). There's really not much to this game honestly so I have no choice but to call this game a disappointment. 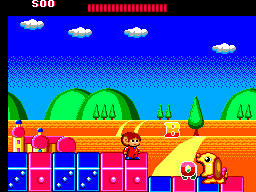 The game looks more colourful and garish than Miracle World. The levels are nicely detailed and Alex looks cuter than ever I suppose but the enemy designs are so bizarre (one in particular) that makes you ask if Sega doesn't know if they want to be a company for kids or teens. At least it's fun to look at. The music's okay but nothing memorable. It's also repetitive depending if you're playing the entire game and it's not as good as the arcade version or Miracle World. The sound effects are just average although the scream Alex makes when he gets hit is so......WHY WOULD HE SCREAM LIKE A SCARED LITTLE GIRL IT MAKES NO SENSE. Okay enough about the sound, moving on. I will say the game controls better than Miracle World and that they compliment the level design a little more. The swimming control on the other hand is garbage (going a little American there for once). It feels so heavy and stiff compared to Miracle World's somewhat wonky swimming. That's all I need to say really. There's absolutely little to no replay value. All I need to say is play the first 7 levels twice and that's it. The second time is more challenging but that's about it. After you play the game once or twice you'll no longer have a reason to play it again unless you really had so much fun with the game which I sort of doubt. 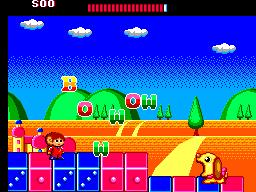 Keep in mind that this is not the worst game in the Alex Kidd series and to be honest it is a fun game in its own right. It's just that after the amazing first game you'd expect the sequels to be just as good, only to be left disappointed with one exception. In the end, Lost Stars is just average at best.